This week, we're getting Kidnapped, which has nothing to do with the Robert Louis Stevenson novel. Published by SoftSide Publications, I haven't been able to track down the original TRS-80 version written by Peter Kirsch, but conversions survive for the Atari 400/800 and Apple II computers. 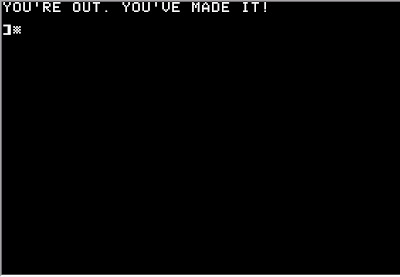 We're playing the Apple II version here, after I wasted some time wrestling with a very buggy, typo-ridden and unfinishable version I found online for the Atari 400/800 (probably an unofficial conversion or a poor type-in job.) Mr. Kirsch created a number of the SoftSide Adventures later on, though this one doesn't appear to be an official numbered part of that series. 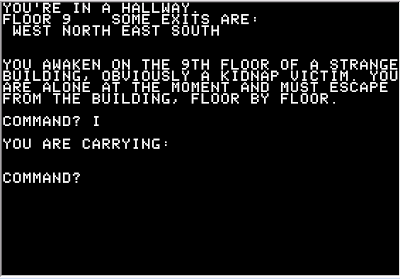 Kidnapped is essentially nine simple escape adventures in a series -- everything we need to escape each floor is available there, and nothing gets carried from one floor to the next, so it's really a collection of mini-adventures. We awaken on FLOOR 9, vaguely aware that we have been kidnapped and are now alone. North of the starting point is an office with a paper note reading, "IMPORTANT TV PROGRAM ON." There's a closet containing a LONG BROOM to the north; on the east side of the map, there's an elevator with a trap door in its ceiling that's too hard to reach, and a maintenance room contains a locked cabinet. Suddenly there's a POWER FAILURE! And moving in the dark tends to be fatal, so we have to start over. This time I go west from the starting point and find another office with a TV and a CLOCK -- LOOK and EXAMINE CLOCK fail, but READ CLOCK tells us it's 3 P.M. at the moment READ GRAFFITI in the rest room yields, "WATCH OUT FOR LIVE ONES," and we can WATCH TV to learn that the power gets cut off at midnight, so that's probably what went wrong on my earlier attempt. The most important room on this floor seems to be the office south of the starting point, where we can see a key on the ledge outside an open window; going onto the ledge is fatal as it breaks away, and our arms are too short to reach it, but we can GET KEY if we have the long broom in inventory. The power failure seems intended to keep us moving, so there's definitely some time pressure here! Moving efficiently, we get the broom, get the key, unlock (actually OPEN) the cabinet and get a flashlight and some ELECTRICAL TAPE. But once the power failure happens, we still can't LIGHT FLASHLIGHT in the dark, and apparently just standing in place fiddling with it is potentially fatal as YOU FELL AND BROKE YOUR NECK yet again. So we need to be sure to light it before the power failure occurs. We need the office chair to get to the trap door in the elevator; after we DROP CHAIR we can GO DOOR, as YOU STEP ON CHAIR AND JUST MANAGE TO REACH THE TRAP DOOR. Now we can see THE ENDS OF TWO LIVE WIRES in the elevator shaft, and TAPE WIRES to... get ourselves electrocuted, dang it. We have to wait until the power goes out and/or the clock tells us it's PAST MIDNIGHT (literally!) to get the elevator fixed, then we can PUSH DOWN (despite the lack of power) to reach the eighth floor, dropping everything we have along the way. Starting fresh on floor 8, we find ourselves in a hallway. South is an office containing a sleeping pill and a vicious doberman blocking the way east. West of our entry point is an aquarium full of piranha fish, and further west a closet containing some rope. Trying to GET FISH isn't recognized, and trying to GET PIRANHA results in a horrible death, as we might have expected. If we GIVE PILL to the dog, nothing happens and GIVE is just interpreted as DROP, but we can "give" it to the piranha to end up with a SLEEPING PIRANHA, which proves portable. Taking one and trying to GIVE it to the dog produces dinner -- for the piranha, not the doberman, but the piranha then dies of overeating and we can access an office. The OPEN WINDOW is inviting, but we can't just GO WINDOW; we have to TIE ROPE (to the desk) and then we can CLIMB ROPE down to the 7th floor, again abandoning anything we are carrying. The seventh floor features a KEY MAKING MACHINE -- since we can't EXAMINE anything in this game, we'll have to take it face value. A TOOL CRIB contains some SUPER GLUE and a WOODEN STAIR STEP, so we'll probably be doing some repairs to the steps down to floor 6. A small storage room contains a THICK COPPER SHEET, which we can probably use to MAKE a KEY -- yep, we fashion a CRUDE KEY despite having no idea what the door's tumbler configuration looks like, and now we can OPEN DOOR, and while we can't FIX STEPS or REPAIR STEPS we can GLUE STEP to make our way down to floor number six. Here, we find a TANK OF HELIUM GAS in a closet -- we can't GET TANK but we can GET GAS. A STRING VENDING MACHINE charges $1.00 for string, in one of those only-in-adventure-games scenarios where demand for something as simple as string is so high that vending machines are placed in office buildings. A window features a WIDE, LONG LEDGE, which (in case you were wondering) we can use to access another room -- oddly enough, a VAULT that's accessible by an open window from an easily navigable ledge. 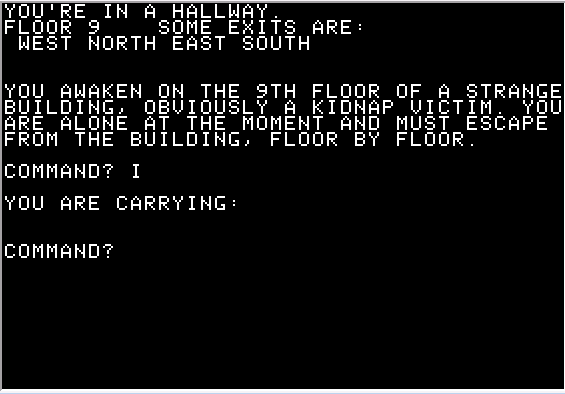 The KIDNAPPER is in the vault, counting cash, so we'll probably want the GUN found lying around in another office, and we'll pick up the LARGE DEFLATED BALLOON from the game room just in case. Trying to SHOOT KIDNAPPER actually doesn't work -- we have blanks, and he fires back with real bullets. We can INFLATE BALLOON, but we can't TIE it to anything just yet. However, we can use the gun (without firing it) to GET MONEY by threatening the kidnapper, who is now scared. (We can actually do this multiple times, ending up with individual DOLLAR items in inventory until we run out of space). We can't BUY STRING or GET STRING, but we can PUT DOLLAR to obtain a LONG STRING. With the helium-filled balloon tied off with string, we can JUMP from the ledge and float down to the next floor. The fifth floor features a raging fire blocking one hall, and we can PUSH BUTTON in another room to turn on the sprinkler system, except our clothes get soaked so we have to strip down and continue the adventure naked. An admirable if misplaced sense of propriety prevents us from an entering a room where some YOUNG GIRL OFFICE WORKERS are present, so even though we would be perfectly able to explain the situation while hiding discreetly around the corner, we can't continue until we use the KNITTING NEEDLES and BALL OF YARN elsewhere on this floor to KNIT CLOTHES -- a fine suit, even, though it seems we could have gotten by with less. Now we can endure the presence of the office staff to obtain a small key from the office -- again, not asking the girls for help or explaining the situation -- and unlock a door to reach the fourth floor. We're more than halfway down the building now! The third floor! Some restroom graffiti reads, "DO YOU HAVE A SPLIT PERSONALITY?" We're not strong enough to OPEN the steel DOOR that blocks passage to the next area, but there are some mysterious jars in a laboratory here. The YELLOW SOLUTION is labeled ANTIDOTE, and the FLUID has an undecipherable label. We can DRINK FLUID to transform into MR. HYDE -- YOU ARE VERY STRONG!, which is good because if that didn't happen we'd be much more vexed than we have been so far. Now we can open the steel door and slide down a child's slide to the next floor, but if we didn't take the antidote fairly quickly then FLUID POISONS YOU. So we need to DRINK SOLUTION (the antidote) before we GO SLIDE. We're making rapid progress now. The second floor presents us with a DROOLING ALLIGATOR blocking a staircase; he has THE REMAINS OF A KIDNAPPER IN HIS MOUTH, so even if we die now we may at least feel that justice was served. There's a water cooler here with a single paper cup, probably due to budget cutbacks; we can GET WATER and POUR WATER on a plant (though we can't WATER PLANT) in the next room, causing it to grow tall enough to let us climb through a trap door in the ceiling into a crawlway. We find a FLUTE at the other end of this passage, and can see some coiled rope in the room below, and of course PLAY FLUTE establishes that the INDIAN ROPE RISES UP TO YOU, so we can CLIMB down the ROPE and then GO STAIRS, bypassing the alligator. 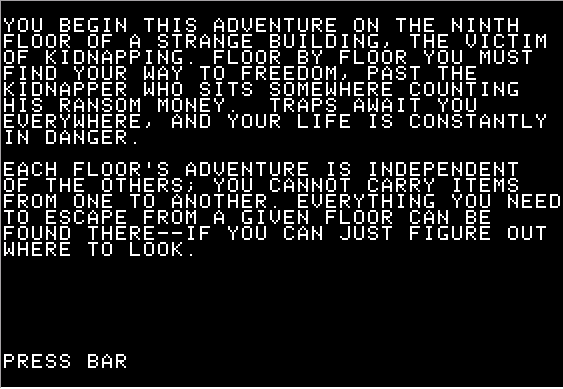 While there's a fair amount to do in Kidnapped, there's no real challenge to speak of -- once I realized how limited the parser was, and that there are really no hidden exits or non-obvious solutions to the typical early-80s adventure game puzzles, everything was straightforward and I didn't even need to draw a map. But there's a bit of humor here, and it's interesting historically as a forerunner to the later Softside Adventures, some of which were also written by Mr. Kirsch, and some of which were similarly episodic in style. 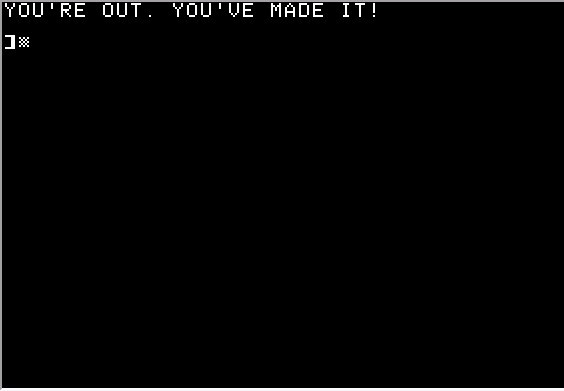 I enjoyed finishing it, primarily because most of the challenge in this case was finding a playable copy of the game! This was one of those busy weeks when I needed something very straightforward to play -- I'm working on a couple of larger games, and I tried tackling one adventure that I thought would be a short experience but seems likely to keep me busy for a while. I then found a version of an old magazine listing adventure only to find it poorly typed-in, as a lot of stuff seems to be broken to the point of unplayability. 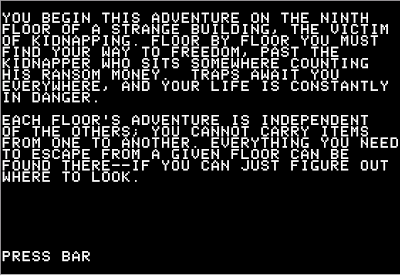 So in the interest of having something to post this week, I'm tackling this brief demo adventure, King's Ransom, released by Incentive Software in 1986 to show what could be done with the company's Graphic Adventure Creator tool. 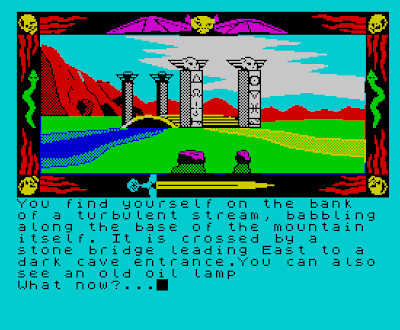 The engine originated on the Amstrad CPC computers available in Europe, but was ported to a number of other 8-bit home computers; we're playing this one on the Sinclair Spectrum ZX. We begin on the bank of a stream, where we can GET LAMP to honor tradition, picking up an old oil lamp. RUB LAMP doesn't produce any magical or interesting results, but we can LIGHT LAMP and produce sufficient light to explore the dark cave to the east. There's a dead rat lying here by the moat, and if we GET RAT and take it with us, the snake in the dark cave wakes, eats the rat, and goes back to sleep, instead of bothering us. Traveling east past the snake, we find ourselves on the edge of a huge lake, where a solitary tree stands; we can EXAMINE TREE to dislodge a key from its branches. There's also a passage south of the snake area into a crevasse -- literally, as traveling that way plunges us into a pit, to meet your doom on the jagged rocks below! So that's a bad navigation decision. The door to the fortress is a heavy oak door, looks very strong -- but its lock can be opened with the key we found lying around in a tree, allowing us to go east into the grim interior. Fortunately, we don't have to look very hard for the treasure -- there's a gold bar just sitting here. But we do run into a strict two-item inventory limit -- one item per hand? -- so we have to DROP KEY before we can GET BAR. The bar upon further examination must be worth a fortune, judging by the size of it, so this seems to be what we've come for. Are we going to be allowed to just walk out of here with it... ? Yes, actually. We simply have to return to the starting location with the gold in hand, and victory is ours! Obviously, this "game" was designed to provide a quick sample of the GAC system's capabilities, and it provides just enough to accomplish that goal. It seems like a decentt tool for the job -- the parser works fine, and the graphics editor seems very solid judging from the results. It uses both vector-and-fill and bitmapped graphics to provide a reasonable compromise between detail and storage efficiency, and in this example it sidesteps the Spectrum's usual color-clash problems nicely. I'm interested in playing some more of the games created with it -- GAC wasn't a huge hit as engines go, but it still saw more than a hundred games published and I'm sure a few of them are well worth experiencing. 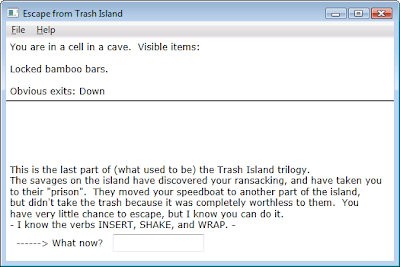 I hate to stop in the middle of a story, so this week we're going to continue with the second part of Roger M. Wilcox's Trash Island series (formerly the third part of the Trash Island trilogy) -- Escape from Trash Island, the eighteenth game in his TRS-80 series. It was originally written in 1981, and we're playing the author's 2012 Windows port here. The previous chapter was a treasure hunt -- an unsanctioned activity, apparently, as the local authorities have now locked the player in a cell. So this one is an escape-the-island adventure. After we enter the password from the previous episode, we find ourselves locked behind bamboo bars in a cell in a cave, where we have been consigned after ransacking the island's trashy treasures. It's hinted that the verbs INSERT, SHAKE and WRAP may come in handy, which saves us some parser wrestling later at the expense of giving away a few puzzle solutions. We have nothing in inventory at the start, and the cell features Locked bamboo bars and a passage D to a... well, this is an unexpected surprise. The posessions [sic] room contains our faithful and handy Shovel and Skeleton key from the previous adventure! We can DIG down here to find a Puddle of crude oil, which may come in handy as the hinges (?) on the bamboo bars in the cell are jammed tight. And You can't dig a bars. No matter how hep it is, daddy-o. Fortunately, we don't need anything fancy here -- we can simply GET OIL to carry the puddle of crude oil around in our pocket, and OIL BARS to get the hinges nice and greasy. (We can repeatedly dig downstairs to get more oil, should we need it.) Now we can OPEN BARS successfully, and GO BARS toward freedom. Exiting on the north side of the cell, we find ourselves at a "T" intersection. Travel E leads to a caved-in room with a Cave-in in ceiling dominating the view; we can go D from here to find a 120-volt battery in the glow-in-the-dark room. West of the "T" is the weapons room, where we can acquire a Spear, and from here we can go down to the art museum for prisoners, where we see a Foreign painting and some Flash powder. We can't pick up the painting, but if we EXAMINE PAINTING we learn that It is a picture of tools. One of them appears loose. We can SHAKE PAINTING to acquire a Stone pick. Can we use any of this equipment to blow a path through the cave-in area? We can PICK CAVE-IN to reveal a Hole in the ceiling, but we can't GO HOLE yet -- There is something dirty plugging it up. We can DIG HOLE, and a Pile of dirt falls out. There doesn't seem to be anything DIGgable or PICKable in it, but now we can enter a large cavern. There's a bit of Red treated paper here, but it doesn't have anything written on it; we can pick up a Piece of string in a cul-de-sac to the east, and DIG in the same location to find some Steel wool. West of the cavern is an east-west hallway, containing a Churn with heating elements. Interesting. Further west is a dead-end, with no visible or discoverable objects as far as I can see. So we've explored the accessible map to this point, and we have a number of interesting objects in hand. Can we WRAP POWDER in the paper? Yes, and this produces a Stick of artificial TNT. Hmmmm. We can't INSERT TNT into the churn, but we can GET CHURN and then try to CHURN TNT -- but It has no power for the heating elements! We can't CONNECT BATTERY or ATTACH BATTERY, but we can POWER CHURN. Now we can try to CHURN TNT, but You have nothing to churn in it, so apparently the noun doesn't count and nothing we have in inventory is CHURNable. We can RUB WOOL -- Against what? -- hmmmm. Nothing we have seems to do anything interesting. I thought I had tried to DIG and PICK at the pile of dirt, but hadn't tried to EXAMINE it, which suggests that There is something *else* inside the dirt! I must have just tried to DIG at a room level earlier, because we can DIG DIRT to reveal... some more Flash powder. Interesting. We can INSERT STRING to provide a fuse for our makeshift TNT, but rubbing the wool against it doesn't set off a spark. We can dig up some more oil, though, and CHURN it with our Powered-up churn to yield a Churn of gasoline. What next? I got stuck here and had to peek at the code -- it turns out that we want to rub the wool against the battery to make a spark, but once we've got the churn of gasoline (as opposed to the powered-up churn) we can't REMOVE BATTERY to retrieve it anymore. So I've done things a bit out of order here. Deferring powering up the churn for now, we can use the spark and the TNT to blow a hole in the roof at the dead end, and then go back and churn up some gasoline. Going up through the hole in the roof, we find ourselves on the top of a hill. Traveling down the hill and then north, we find ourselves in an abandoned oil field, where we can DIG up some more oil if we didn't go back to the cell for more earlier. East of here is a guard forest with a Deadly savage warrior on duty -- and on my first attempt, The savage lunges with its spear! It gets you! and the adventure is over. 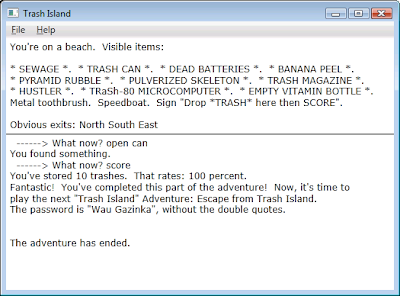 Unlike Mr. Wilcox's more recent Windows ports, Escape from Trash Island doesn't allow us to restore a game after dying, which means we have to re-enter the password each time we start up before we can get back to where we were. It took me several retries before I managed to be missed by the warrior's spear and connect with my own. I tried to THROW SPEAR before going in, which didn't help, and SHAKE SPEAR is just a missed joke opportunity; surviving this encounter is just a random event that requires a little persistence and luck. Past the guard forest, we reach a barren and rocky beach... and here's our faithful Speedboat again! The natives don't see the *trash* as worth anything, per the intro, so it's all still here, and all we have to do now is FILL the empty outboard MOTOR, and START it up to head home to victory! 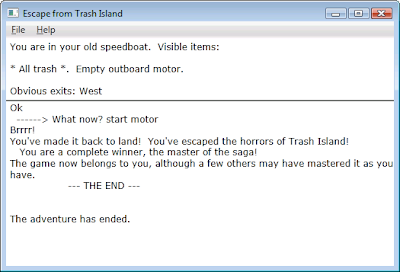 The author's effusive praise seems a bit overblown, given that the Trash Island games are actually less difficult than many of his other adventures. And I was disappointed that the childhood myth concept and maternal conflict mentioned at the start of the first game don't really play out in the saga's conclusion. But I enjoyed both of the Trash Island adventures -- compared to their inspiration, Scott Adams' Savage Island two-game series, these are much more manageable. We've only got a few more Roger M. Wilcox games to tackle, and I expect we'll continue with them soon. 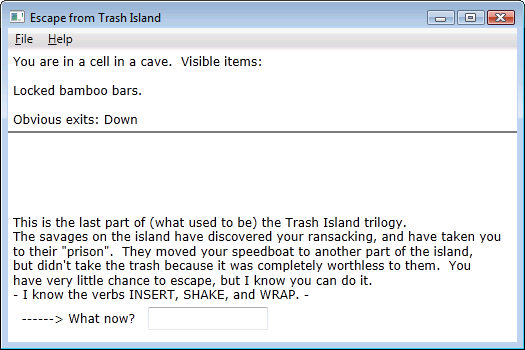 Returning to the Roger M. Wilcox oeuvre, this week we're tackling Trash Island (full title: Trash Island - The Hidden City of Trash Island), originally the author's sixteenth and seventeenth text adventures on the TRS-80 circa 1981, later combined into a single adventure game in GWBASIC, and converted to the Windows PC version we're playing here in 2012. A third episode exists as a separate game. 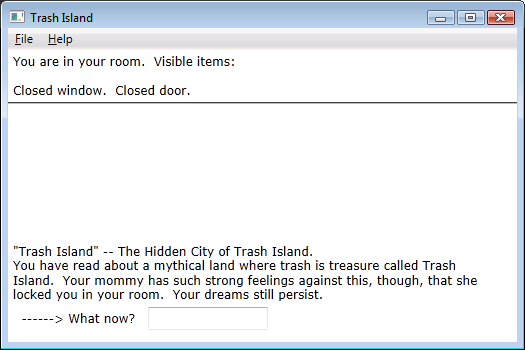 This is an interesting setup -- the player is cast as a child dreaming of the mythical Trash Island, where trash is treasure, locked in his/her room by a disapproving mother. The game itself is a treasure hunt in the classic Scott Adams tradition, but this little twist is fun. We begin in the player's room, with a closed window, a closed door, and nothing in inventory. The window is painted shut, but the door can be opened to access a walk-in closet containing a metal toothbrush and a wooden stick (the door leading out of the room is apparently so completely closed by Mom that it's completely invisible.) The toothbrush has a razor's edge on the front and the stick would reportedly make a fine levering handle upon further EXAMINEation. We can't SEARCH PILE or EXAMINE JUNK to any notable effect, but we can GET JUNK to find a broken outboard motor and a metal scoop, both of which may come in handy, and neither counts as a treasure so they must be at least marginally useful. The scoop reportedly has a 1" hole at the back end. East of the junkyard is a Fiberglas factory (this seems to be a brand name and not an alternate spelling of "fiberglass") with a closed (and locked) iron door. North of the factory is a gas station with a gas pump -- I tried to FILL MOTOR, but You're not carrying a motor that can be filled. Maybe it needs repair. East of the factory is a beach -- we can try to DIG, but of course You don't have a shovel! West of the junkyard is a glue factory, which we can enter to see a button and a horse. Oh no... and oh yes, PUSHing the BUTTON immediately turns the horse into Epoxy glue. Can we PATCH SCOOP with the Fiberglas? No, the parser doesn't recognize that verb. FIX SCOOP indicates that It's beyond your power to do that, so the patching cloth, Fiberglas sheets and epoxy glue must not be all we need. Except... ah, yes, we can FIX MOTOR with it -- must have been a housing or fuel tank issue, not a mechanical break -- and now we can FILL MOTOR at the gas station. We land on a beach, where a Large iron rock is the most notable feature. To the east is a scrub forest, sporting only impenetrable scrub; north, another section of beach, with a Slab of flint; and south, a barren field of the sort where digging is often productive. What to do now? Burning the scrub sounds appealing, but we can't seem to STRIKE FLINT against the iron rock. And the boat's motor is empty; we're not going to be able to go back the same way we came right now, so it's a good time to restore and make sure we've exhausted the possibilities nearer home before taking the one-way trip out here. We can ATTACH STICK to make a shovel out of the wooden stick and the metal scoop -- I'm lucking out with my parser guesses so far in this one! -- but there's nothing to DIG up back home. On the island, we can find a bottle of moonshine on the north beach, but it can't be picked up, nor can we FILL MOTOR with it if we bring the motor along (I thought it might work as a sort of ethanol, but nope.) We can't DRINK MOONSHINE either -- You have nothing to drink. DIGging in the barren field yields a lodestone, which proves to be an unsuitable stone for striking the flint. We can't THROW it at the large iron rock, or drop it, or PUSH ROCK to get it nearer the scrub, or anything like that. But it seems that with the Lodestone in hand, we can GET BOTTLE -- oh, no, wait, I was confused. We can GET BOTTLE anytime, and take it along or drink the moonshine if we want to waste it. Only GET MOONSHINE is beyond your power to do that. Ah! I was mentally picturing the large iron rock as much larger than it actually is. We can GET ROCK, and now we can STRIKE FLINT to make sparks. The sparks alone aren't enough to ignite the scrub, but if we POUR MOONSHINE first, we create a brief Whooosh! and are left with a Burnt path through the woods. Now we can GO PATH to reach the fabled Hidden city of Trash Island. A pueblo apartment here contains a grappling hook and some * DEAD BATTERIES * -- our first trash-as-treasure -- as well as an Unlit flashlight. An alley to the south provides a * TRASH CAN * and a manhole cover, which is too heavy to OPEN -- It's made of heavy gauge steel. You'll need a stronger FORCE. Jedi skills? Stone steps to the east lead up to a pyramid, but climbing the steps is too fatiguing at the moment. We can DIG at the foot of the steps to discover a grave containing a * PULVERIZED SKELETON *. We can't carry all these trashy treasures, so I made a trip to dump the three we've found so far in the speedboat; no SCORE progress can be ascertained yet. There's also a drug store atop the hill, where a Bottle of vitamin might help us climb the steps... yes, if we EAT VITAMIN we can make it to the top of the pyramid to collect some * PYRAMID RUBBLE *. We also now have a valuable * EMPTY VITAMIN BOTTLE * left over. I made a trip back to the boat, and we now have 6 treasures accumulated. We can now OPEN the manhole COVER -- the vitamins must have helped -- and collect some * SEWAGE *. We have 9 treasures now, but still no way to get back to the scoring location.... oh, no... something just dawned on me based on a Scott Adams trick... and yep... the SCORE sign is portable! So bringing it to the beach with us makes it possible to score points without having to get back home. So now we have 90% of the available points, but we're still missing one treasure. I think I've tried DIGging everywhere. We can't SWIM on the beach. We still have the lodestone -- does it tell us anything interesting? It doesn't seem to point anywhere and I can't float it in a liquid, though I guess I missed the opportunity to make a moonshine compass if that would have worked. So close! 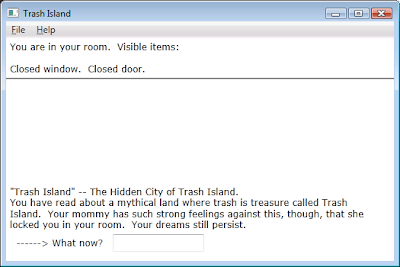 But I had to sneak a peek at the code to see that the treasure we're missing is a * BANANA PEEL * -- and then it wasn't hard to guess that we can find it by OPENing the trash CAN. 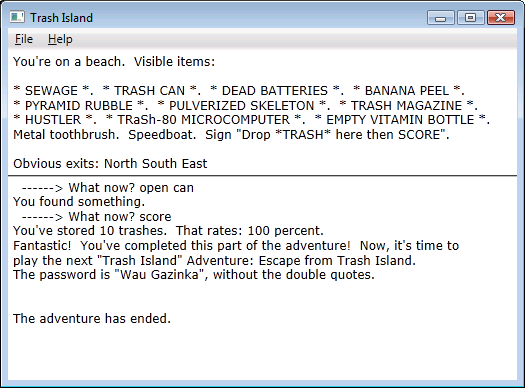 Now we have all ten treasures, and have earned the password to access the next game: Trash Island Adventure: Escape from Trash Island. Victory is ours! I was expecting this to be a longer and more difficult adventure, given its origins as two separate games developed later in Mr. Wilcox's often challenging series, but I have nothing against a pleasant and straightforward afternoon's entertainment. I wish the intriguing premise factored into the plot more -- it's a traditional treasure/trash hunt, despite the stab at a different framing device -- but maybe the player character's youthful rebellion against Mom and her anti-trash conservatism will factor into the exciting conclusion, which we will probably be tackling here in the very near future.